Bill Nye, the science guy. Bill! Bill! Bill! Bill! Bill Nye is back. And this time he is making a science show for teens and adults! Go to the website and click "Menu" and "Episodes" to see clips and more. Each clip has some tabs - the best one, in my opinion, is called "the flip side." Here, he provides links to information about alternate viewpoints on that topic. The entire 13 episode set can be purchased for $499. Apparently the first shows aired in 2005, but according to the website, if you are in Chicago, WTTW (Channel 11?) is still airing the show! (No shows in San Francisco.) There are also a few examples on YouTube (here's one on Cloning)... at least until Bill Nye pulls them off for copyright infringement. There is a cool site that measures your uploading and downloading speed on any computer that you are using. Speedtest.net is a free broadband speed test with servers located all over the world. All you have to do is click on the "pyramid" nearest you! 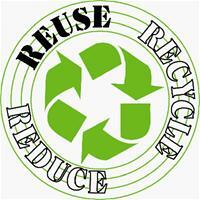 We are all familiar with the 3 R's of recycling: Reduce, Reuse, Recycle. However, I have been hearing more about the interesting idea called precycling: the idea of supporting responsible packaging and consciousness of waste before you even use the product. It just makes sense. I was surprised to find an article using this term that was posted back in 1994. Reading more about the history of precycling, I found out one of the first communities to focus on precycling was Berkeley, CA all the way back in 1989! Rebuy (buy recycled) whenever possible. Avoid the paper vs. plastic dilemma. Don't buy plastic razors, throwaway cleansing pads and cigarette lighters, non-refillable pens and foil baking pans. Reduce or eliminate your use of disposable plastic diapers, which make up 2% of the total U.S. landfill volume. Gr-oss! Compare the size of the package to the size of the product. This mom's blog post offers more ideas on being eco-responsible. Back in October, I had an opportunity to go to Wonderfest held at Stanford University. 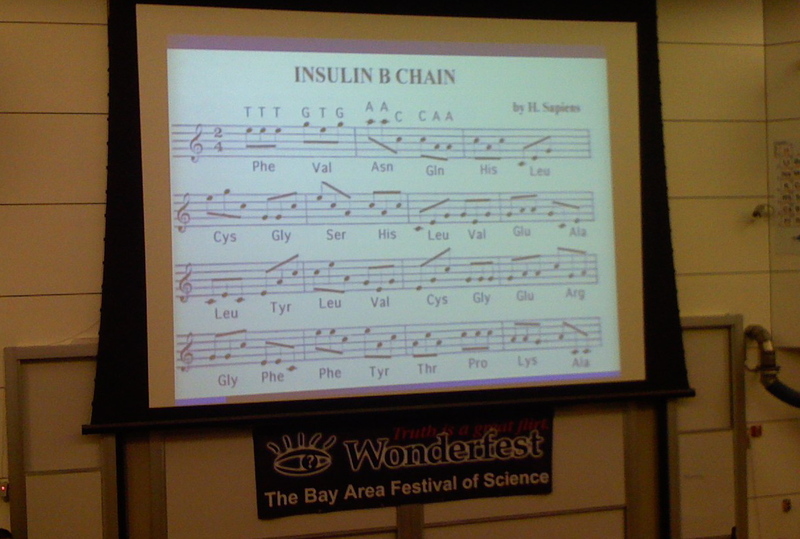 There I heard David Deamer, Professor of Chemistry at UC Santa Cruz, talk about and play his DNA music. Remember that DNA stores the instructions for making you! DNA forms a "double helix" - a kind of twisted ladder in which the "rungs" are made up of nitrogenous bases (A, T, G, or C). A group of 3 of these base pairs is called a codon. Codons tell a cell what amino acid to build. Amino acids are the building blocks of proteins, and proteins are what make the body grow and do a lot of things. Anyway, in his presentation, Deamer says, "If melodies are a sequence of notes, and DNA is a sequence of bases, maybe we can turn DNA into music." He went on to compose pieces with the following translation. For example, the insulin gene is coded "TTT GTG AAC CAA..." and so on. The DNA code dictates the notes played, but he does have some freedom with the timing. You can hear the music if you watch the Wonderfest presentations online. Not surprisingly, it is also posted on YouTube. Fast forward to 16:00 if you would like to hear the part about insulin. David Deamer also partnered with Susan Alexjander, to create a far-out sounding CD called Sequencia. In SEQUENCIA, raw data derived from the light absorption spectra of the four bases (adenine, cytosine, thymine, guanine) that make up the DNA molecule is converted into sonic frequencies. These are programmed to a Macintosh computer and sent to a synthesizer, and then arranged into four pitch collections (or four 'scales' based on the individual base molecules). These synthesized notes mixed with vocals, cello, tabla, and violin become the palettes for Alexjander's compositions, which range from somber and zen-like to fanciful and improvisational. Another link gives specifics on the physics involved in this process. I am having WAY too much fun with these signs. OK, this one really isn't a sign, or even a joke. As I was installing my cousin's Yahoo DSL internet, I ran across this passage in the user agreement. Seriously. So I CAN'T use my Yahoo DSL software to operate my nuclear facility OR life support? Sheesh.